1 – Doing ghusl before going out to the prayer. The last sermon (or khutbah) was delivered by our beloved Prophet Muhammad (saw) during the Hajj of Year 10 (632 C.E), on 9th Dhul-Hijjah at Mount Arafah. 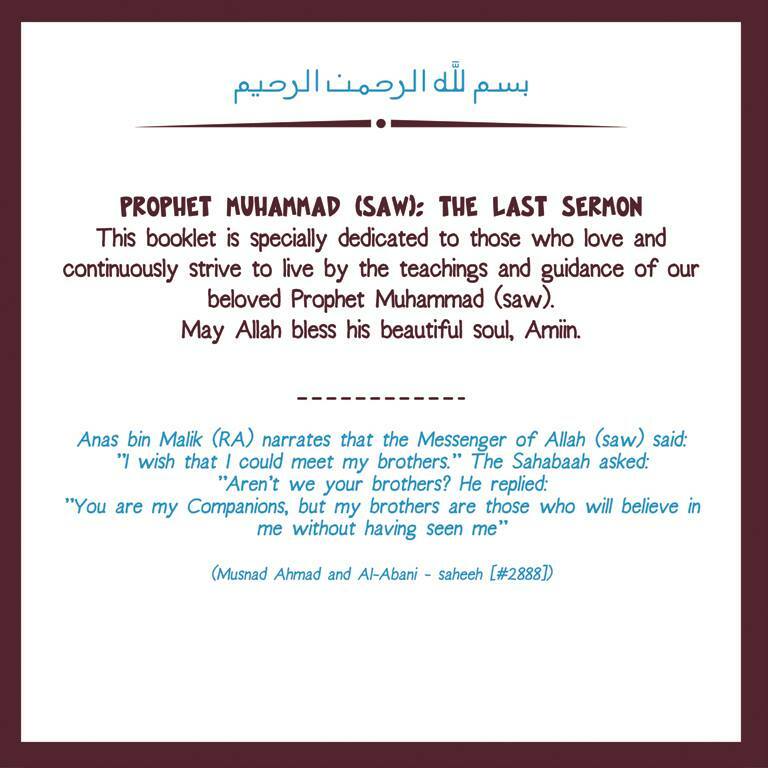 The last sermon delivered by the Prophet (saw) is without a doubt, highly inspiring and heartwarming. After so many years, the contents of the message in the sermon is still powerful and intense. We urge you to read, deeply understand and most important, to share and spread this sermon to others- as much and many as possible, as said by the Prophet Muhammad (saw) at the end of this sermon. No other Ahkam (Islamic law, command) was revealed after this. 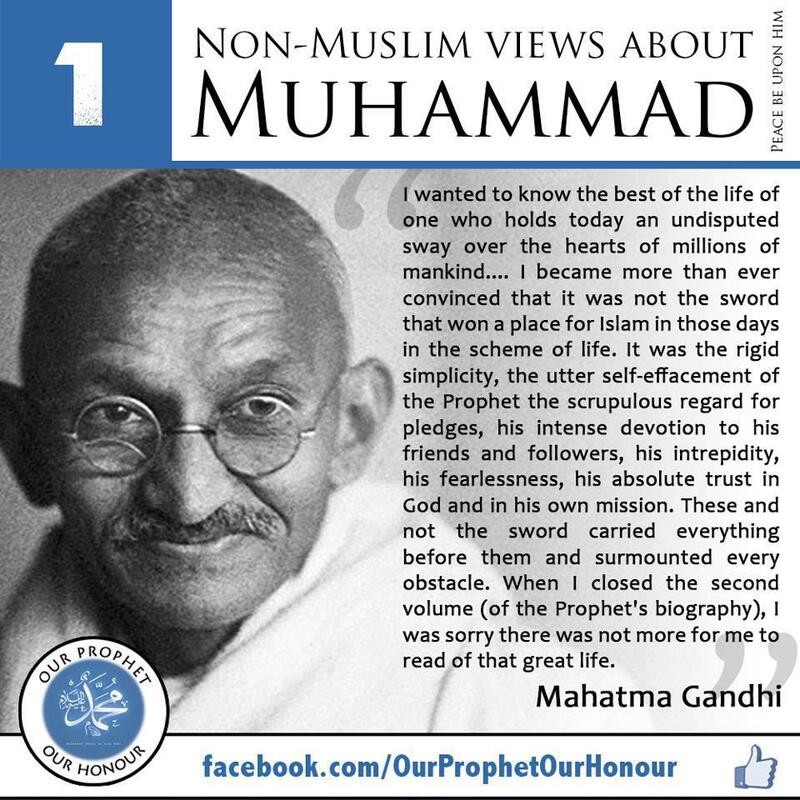 May Allah bless Prophet Muhammad (saw), Ameen! 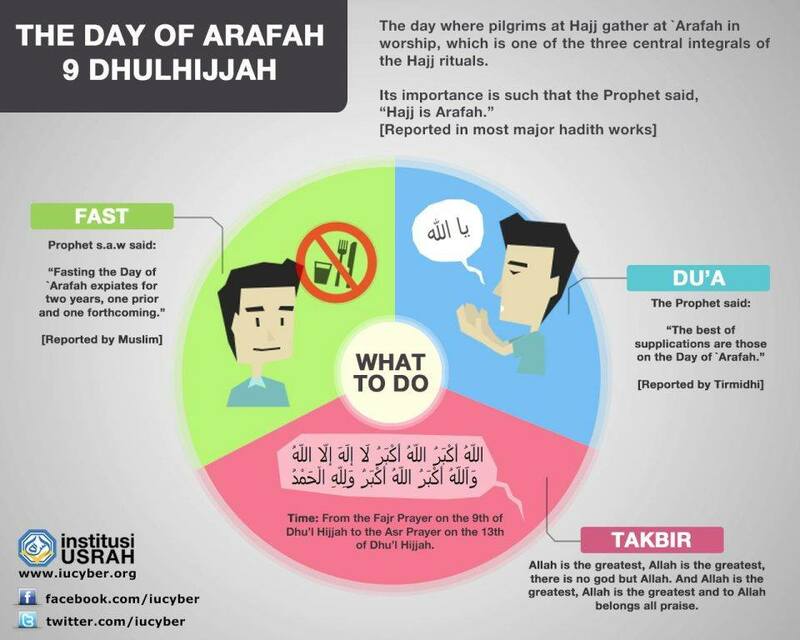 Suggested schedule for the Day of Arafah-!!! 1. Sleep early the night before to strengthen yourself for the special day. 2. Wake up before Fajr for suhoor. 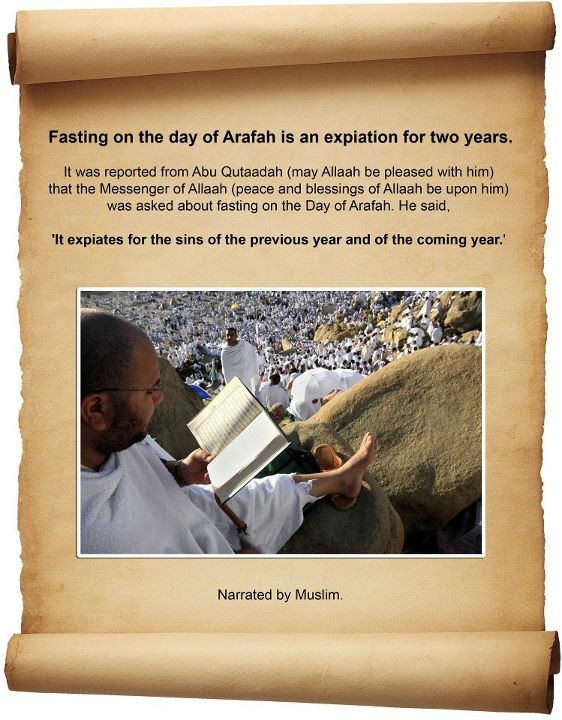 The ninth day of Dhul-Hijjah (the 12th and final month of the Islamic calendar) is the Day of ‘Arafah. 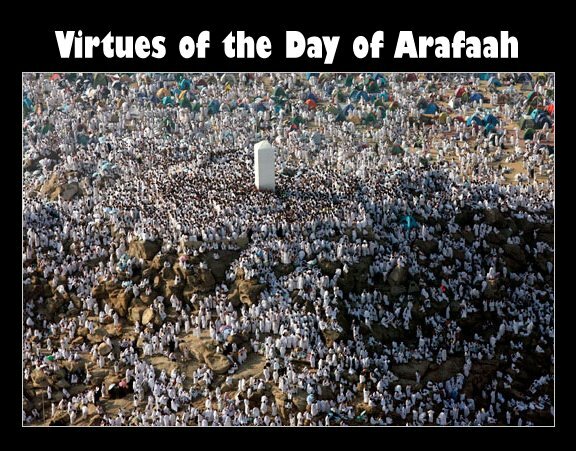 It is the day when pilgrims stand on the plain of ‘Arafah to pray. On this day, Muslims all over the world who do not witness the annual Hajj should spend the day in fasting, in preparation for the three days festivity following ‘Eid ul-Adha (the celebration marking the end of the Hajj commemorating the Prophet Ibrahim’s willingness of sacrifice). Are you planning to do Qurbani this year? Let’s check our intentions first! 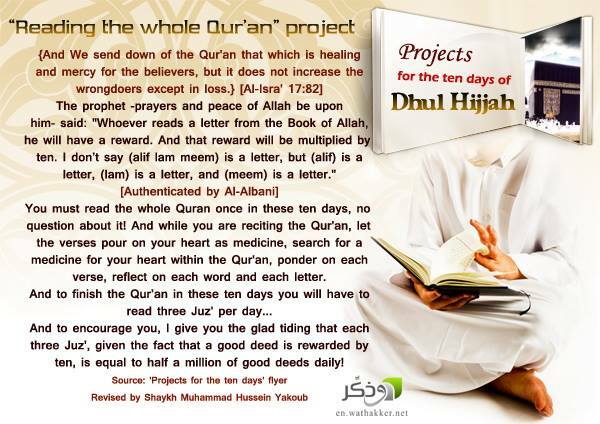 Projects for 10 days of Dhul Hijjah+ pic. 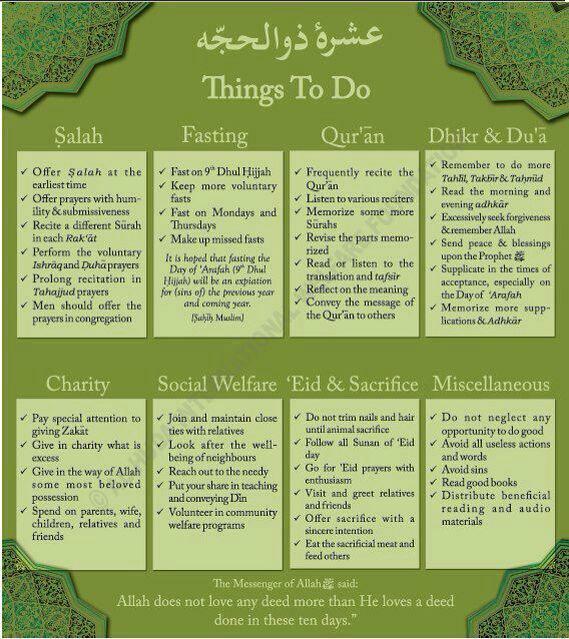 Things to do on the days of Dhul Hijja+ pic. 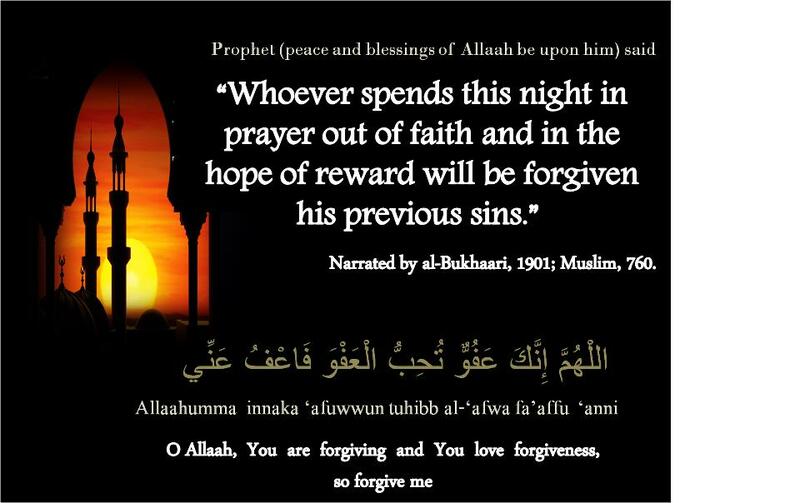 My dear brothers and sisters, you want your sins forgiven for the past year and the year to come? 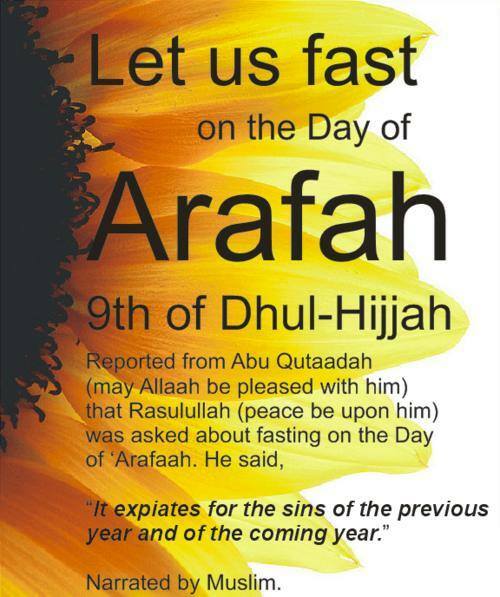 Fast the day of Arafath (9th of Dul-Hijjah). May Allah forgive us and save us from the blazing fire. Aameen. In Al-Saheehayn it was reported from Umar ibn al-Khattaab (may Allaah be pleased with him) that a Jewish man said to him, ‘O Ameer al-Mu’mineen, there is an aayah in your Book which you recite; if it had come to us Jews, we would have taken that day as an Eid (festival).’ Umar said, ‘Which aayah?’ He said: ‘This day I have perfected your religion for you, completed My favour upon you, and have chosen for you Islam as your religion.’ [al-Maa’idah 5:3 interpretation of the meaning]. The Prophet (peace and blessings of Allaah be upon him) said: ‘Yawm Arafaah (the day of Arafaah), Yawm al-Nahr (the Day of Sacrifice) and Ayyaam al-Tashreeq (the 3 days following Yawm al-Nahr) are Eid (festival) for us, the people of Islam. These are days of eating and drinking. This was narrated by the authors of al-Sunan. A humble request to my Muslim brethren. Let us follow the basic etiquette while we sacrifice the animal during Eid Al-Adha. Let’s make sure we do not block the drains, leave the wastes on roads, cause discomfort and problems to others citizens and pollute the environment for diseases to spread. Wherever possible I request all to make sacrifices in open uncemented lands so that the waste is absorbed by the soil, dried up soon and the remains can be cleared off easily. This will save time, energy and water that is required to do the cleaning. This also applies to cleaning the surrounding where the animal was kept and where it was slaughtered. To clear the wastes, the best way is to make a burrow in the ground, dump the entire biodegradable waste in it and cover it with soil. We can thereby convert it to manure and make the soil even more fertile. As told by our Prophet Mohammed (Peace be upon Him) –“Cleanliness is half the faith”. Let us not harm the environment as harmed in other religious practices in India. Any religious practice going against the nature is like going against Allah. Allah has entrusted a duty upon every Human being to protect the nature. 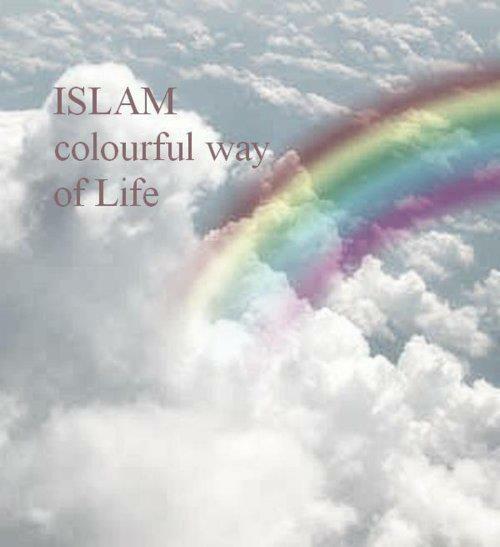 Let us obey the command of Allah & make this world a better place to live in with harmony. “Verily I have turned my face to that Being who has created the skies and the Earth in the state of the Straight Deen of Ibrahim – and I am not amongst the Mushrikeen. Definitely, my Prayer, my Worship and my living and dying is all for ALLAH, who is the Lord of the worlds, and who has no partner. 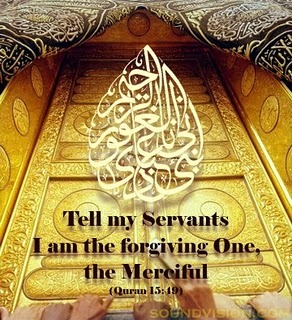 I have been ordered (all that passed) I am amongst the Muslimeen (the obedient). O ALLAH this sacrifice is due to You granting us the ability to do so and it is for You”. 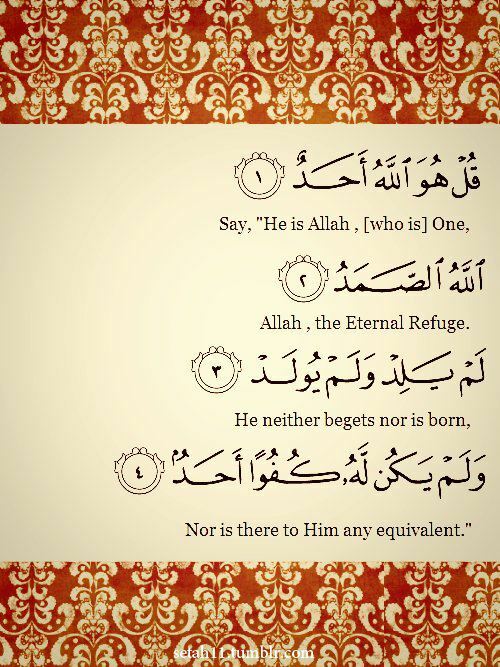 It is necessary (wajib) for every Muslim (male or female, whether praying in congregation or alone) to make the following takbir (declaration of the greatness of Allah) immediately after each obligatory (fard) prayer. To: the Asr Prayer on the 13th of Dhu’l Hijjah. Thus, these takbirs last 5 days, and 23 prayers. Allahu Akbar, Allahu Akbar, La ilaha illa Llahu. Wa Llahu Akbar, Allahu Akbar wa lillahi Lhamd . The specific mention of these four months does not mean that any other month has no sanctity, because the month of Ramadhaan is admittedly the most sanctified month in the year. But these four months were specifically termed as sanctified months for the simple reason that even the pagans of Makkah accepted their sanctity. The sanctity of these four months was established right from the day ALLAH created the universe. Since the Pagans of Makkah attributed themselves to Ibraaheem (Abraham) who observed the sanctity of these months, they also observed the sanctity of these four months and despite their frequent tribal battles, they held it unlawful to fight in these months. Although the fasts of the month of Muharram are not obligatory, yet one who fasts in these days out of his own will is entitled to a great reward by ALLAH Almighty. The Hadeeth cited above signifies that the fasts of the month of Muharram are most rewardable ones among the voluntary fasts. 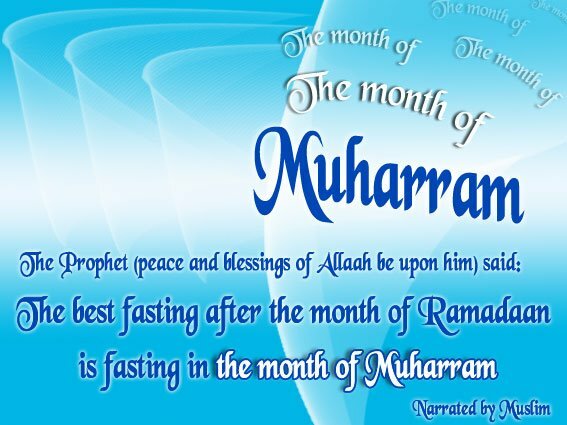 It does not mean that the award promised for fasts of Muharram can be achieved only by fasting for the whole month. On the contrary, each fast during this month has merit. Therefore, one should avail of this opportunity as much as he can. • This is the day on which Aadam was created. • This is the day when Ibraaheem was born. • This is the day when ALLAH accepted the repentance of Aadam . • This is the day when Doomsday will take place. Whoever takes a bath on the day of ‘Aashooraa’ will never get ill.
All these and other similar whims and fancies are totally baseless and the traditions referred to in this respect are not worthy of any credit. Some people take it as Sunnah (established recommended practice) to prepare a particular type of meal on the day of ‘Aashooraa’. This practice, too, has no basis in the authentic Islamic sources. 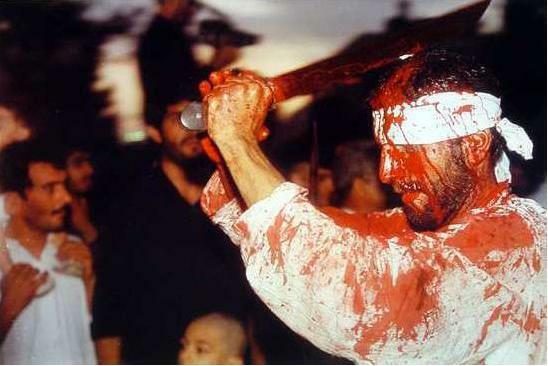 Some other people attribute the sanctity of ‘Aashooraa’ to the martyrdom of Al-Hussayn . No doubt, the martyrdom of Al-Hussayn is one of the most tragic episodes of our history. Yet, the sanctity of ‘Aashooraa’ cannot be ascribed to this event for the simple reason that the sanctity of ‘Aashooraa’ was established during the days of the Prophet much earlier than the birth of Al-Hussayn . On the contrary, it is one of the merits of Al-Hussayn that his martyrdom took place on this blessed day. Another misconception about the month of Muharram is that it is an evil or unlucky month, for Al-Hussayn was killed in it. 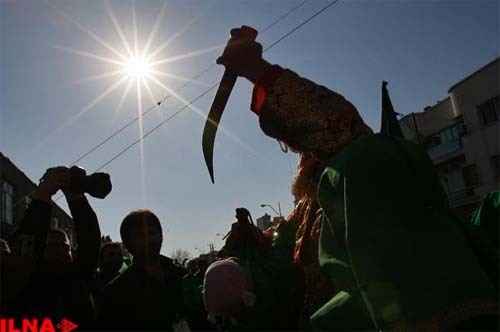 It is for this misconception that some people avoid holding marriage ceremonies in the month of Muharram. This is again a baseless concept, which is contrary to the teachings of the Holy Quran and the Sunnah (Prophetic Tradition). If the death of an eminent person on a particular day renders that day unlucky for all times to come, one can hardly find a day of the year free from this bad luck because every day is associated with the demise of some eminent person. The Holy Quran and the Sunnah of the Prophet have liberated us from such superstitious beliefs. Another wrong practice related to this month is to hold the lamentation and mourning ceremonies in the memory of martyrdom of Al-Hussayn . As mentioned earlier, the event of Karbalaa’ is one of the most tragic events of our history, but the Prophet has forbidden us from holding the mourning ceremonies on the death of any person. The people of Pre-Islamic ignorance era used to mourn over their deceased through loud lamentations, by tearing their clothes and by beating their cheeks and chests. It is evident from this advice, that this type of mourning is condemned even by the blessed person for the memory of whom these mourning ceremonies are held. Every Muslim should avoid this practice and abide by the teachings of the Prophet (pbuh). 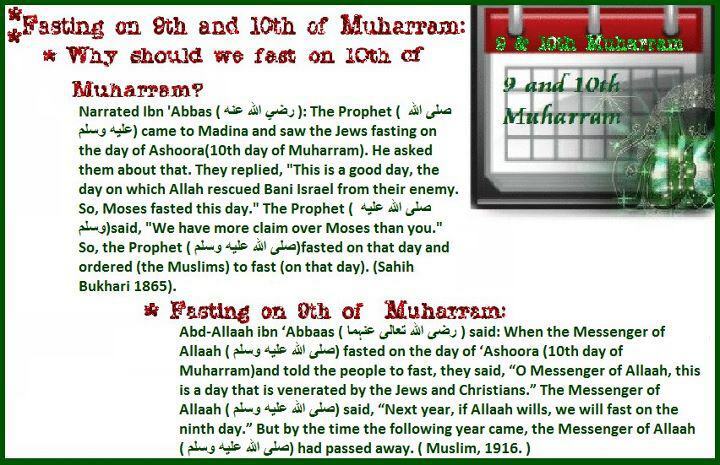 ★ Why should we fast on 10th of Muharram? Narrated Ibn ‘Abbas ( رضي الله عنه ): The Prophet ( صلى الله عليه وسلم) came to Madina and saw the Jews fasting on the day of Ashoora(10th day of Muharram). He asked them about that. They replied, “This is a good day, the day on which Allah rescued Bani Israel from their enemy. So, Moses fasted this day.” The Prophet ( صلى الله عليه وسلم)said, “We have more claim over Moses than you.” So, the Prophet ( صلى الله عليه وسلم)fasted on that day and ordered (the Muslims) to fast (on that day). (Sahih Bukhari 1865). What is the wisdom behind fasting the ninth as well as the tenth? 1 – The intention behind it is to be different from the Jews who limit their fasting to the tenth day. This was narrated from Ibn ‘Abbaas. 2 – The intention was to join the fast of ‘Ashoora’ to another day, just as it is not allowed to fast on a Friday on its own [but it is allowed if one fasts the day before or the day after as well]. 3 – The idea is to be on the safe side and make sure one is fasting on the tenth, in case the moon sighting was not accurate and what people think is the ninth is actually the tenth. Eid-ul-Adha or ‘the feast of the sacrifice’, commemorates Prophet Ibrahim’s unselfish act of sacrificing his son Ishmael to God. 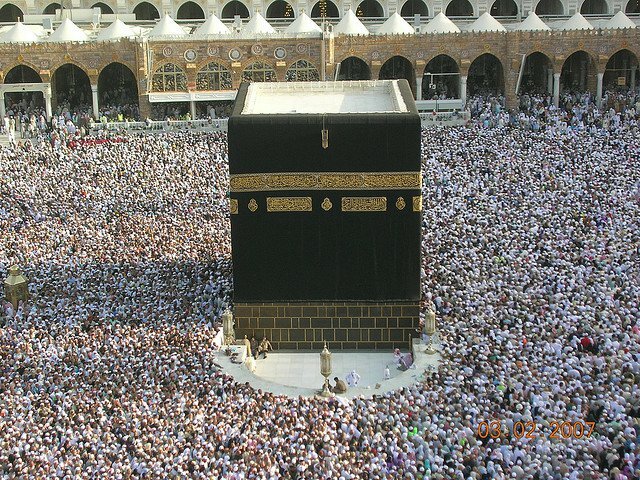 This important holiday is celebrated at the end of Hajj, which is an annual pilgrimage to Mecca. The ‘Festival of Sacrifice’ is followed by a ‘Feast of Sacrifice’, which pays homage to the prophet Abraham’s unselfish act of sacrificing his son, Ishmael, to God. In turn, God spared the boy’s life and instead substituted a sheep. Now in remembrance, people sacrifice a lamb, goat, or other animal, and give the meat to family, friends, relatives, and most importantly, the poor. This holiday is now celebrated in American cities with prayer, community gatherings, and the tradition of dressing up in special clothes to visit friends and relatives. Eid ul-Adha occurs on the tenth day of the Islamic month of Dhul Hijja. It is one of two Eid festivals that Muslims celebrate. 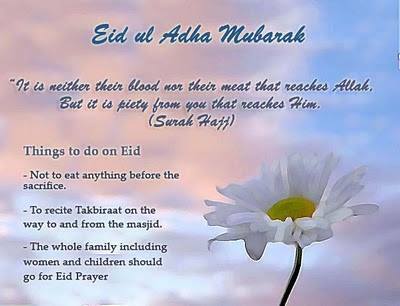 Eid ul-Adha is celebrated by Muslims worldwide as a commemoration of Prophet Ibrahim’s willingness to sacrifice his son (Ishmael) for God (Allah). This very important Muslim holiday is celebrated at the end of Hajj, which is an annual pilgrimage to Mecca. Others celebrate Eid-ul Adha as it marks the end of the Pilgrimage or Hajj for the millions of Muslims who make the trip to Mecca each year. Like Eid ul-Fitr, Eid ul-Adha also begins with a short prayer followed by a khutba. In Mecca, the Khutba is delivered from Mount Arafat. People hold Eid parties and give presents to their children. This is just one more example of the diverse and rich culture that makes up our great nation. AllahuAkbar AllahuAkbar Lailaha illallah, AllahuAkbar WallahuAkbar walillahil hamd. Question- About unrestricted Takbeer during Eid al-Adha – is the Takbeer following every prayer included in the unrestricted Takbeer? Is it Sunnah, mustahabb or bid’ah? – which are the days of Tashreeq. Ibn ‘Umar and Abu Hurayrah (may Allaah be pleased with them both) used to go out to the market-place on first ten days of Dhu’l-Hijjah, reciting Takbeer, and the people used to recite Takbeer because of their Takbeer. ‘Umar ibn al-Khattaab and his son ‘Abd-Allaah (may Allaah be pleased with them both) used to recite Takbeer during the days of Mina in the mosque and in the camps, and they would raise their voices until Mina echoed with their Takbeer. It was narrated that the Prophet (peace and blessings of Allaah be upon him) and a group of the Sahaabah (may Allaah be pleased with them) used to recite Takbeer following each of the five prayers from Fajr on the day of ‘Arafaah until ‘Asr on the thirteenth day of Dhu’l-Hijjah. This applies to those who are not on Hajj; for those who are on Hajj, they should concentrate on their ihraam and recite the Talbiyah, until they throw the stones at Jamarat al-‘Aqabah on the Day of Sacrifice (Yawm al-Nahr); after that they may recite Takbeer. “Some would recite the Talbiyah on the Day of ‘Arafaah, and they were not told off for doing so, and some would recite Takbeer and they were not told off for doing so.” (Narrated by al-Bukhaari). But it is better for the one who is in ihraam to recite the Talbiyah and for the one who is not in ihraam to recite Takbeer on the days mentioned. 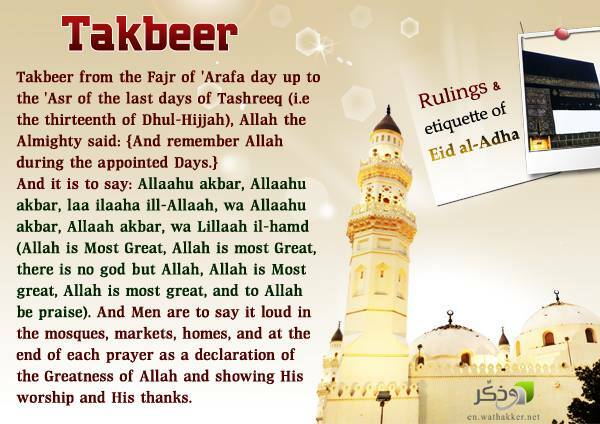 Hence we know that unrestricted takbeer and takbeer restricted to certain times are combined on five days, i.e., the Day of ‘Arafaah, the Day of Sacrifice and the three days of Tashreeq. With regard to the eighth day (of Dhu’l-Hijjah) and the days preceding it, Takbeer on those days may be done at any times, not only at certain times, because of the aayahs and reports mentioned above. In al-Musnad it is narrated from Ibn ‘Umar (may Allaah be pleased with him) that the Prophet (peace and blessings of Allaah be upon him) said: “There are no days on which good deeds are greater or more beloved to Allaah than on these ten days, so recite much Tahleel (saying Laa ilaaha ill-Allaah), Takbeer (saying Allaahu akbar) and Tahmeed (saying al-hamdu Lillaah),” or similar words. It is Sunnah to recitetakbeer (saying Allaahu akbar (Allaah is most great)), tahmeed (saying al-hamdu Lillah (praise be to Allaah), tahleel (saying Laa ilaaha ill-Allaah (There is no god but Allaah)) and tasbeeh (saying Subhaan-Al laah (Glory be to Allaah)), during the first ten days of Dhu’l-Hijj ah. These 10 days are better than allother days of the year! 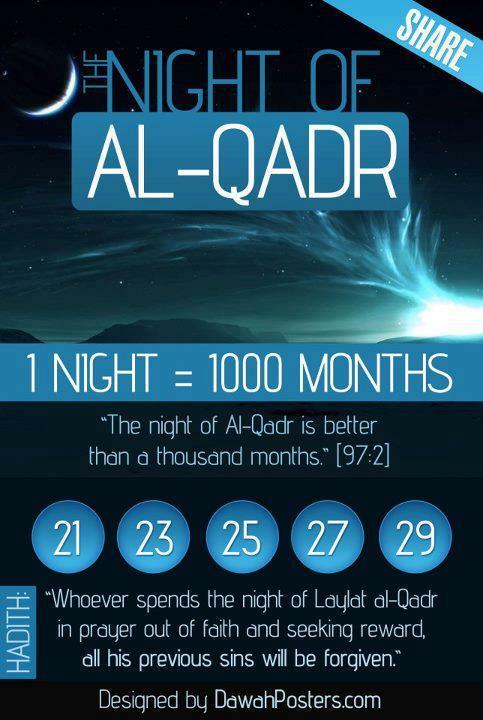 So let’s take advantage InshaAllah! 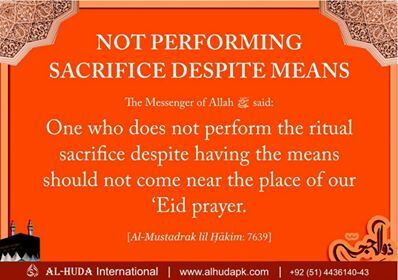 -Its only for those people who wants to sacrifice & not for all as the hadith says …anyone of you wants to offer a sacrifice…. The prohibition of cutting nails and hairs only applies to the person who wants to sacrifice. .. His family members are allowed to cut their hairs and nails..
With regard to the family of the one who is going to offer the sacrifice, they are not subject to any obligation s, and it is not forbidden for them to remove anything fromtheir hair or nails, according to the sounder of the two scholarly views. Rather the ruling applies only to the one who is going to offer the sacrifice, the one who has bought the sacrificia l animal from his own wealth. 1: Hajj is performed in this month. 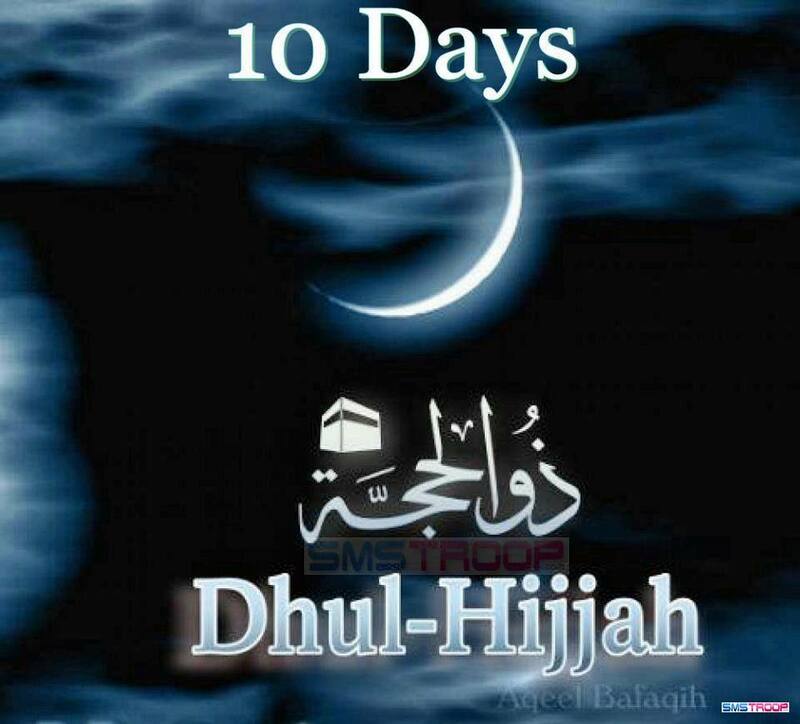 2: The first ten days of ZulHajjah are extremely sacred and good deeds are most beloved to Allah in these ten days. 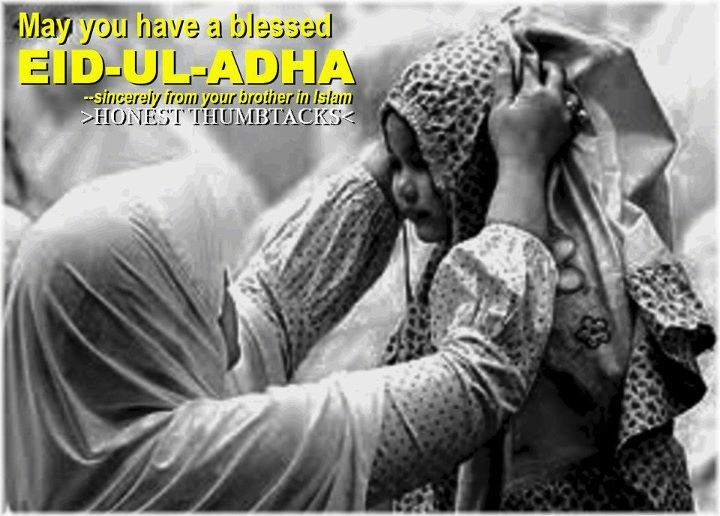 4: The second Muslim festival Eid ul Adha falls on the 10th of ZulHajjah. 5: An animal sacrifice in memory of the sacrifice of Prophet Ibrahim (as) is offered on 10th ZulHajjah. Baheemat al-an’aam (translated here as “beast of cattle”) includes camels, cattle and sheep. This is what is well known among theArabs, and this was the view of al-Hasan, Qataadah and others. It should have reached the age stipulated in sharee’ah, which is six months for a sheep and the age at which the animal is considered to be an adult for any other animal, because the Prophet (peace and blessings of Allaah be upon him) said: “Do not sacrifice anything but an adult animal, unless it is difficult for you, in which case youmay slaughter a six-month old lamb (jadh’ah).” Narrated by Muslim. A mature animal means one that is considered to be an adult. In the case of camels it means one that is fiveyears old. For cattle, it means one that is two years old. For sheep it means one that is a year old. The jadh’ah is that which is half a year old. Soit is not correct to sacrifice a camel, cow or goat that has not yet reached maturity, or a sheep that is less than six months old. i – An obvious defect in one eye, such as when the eye is sunken in its socket, or when it sticks out like a button, or is white and obviously defective. ii – Obvious sickness, whose symptoms are clearly apparent in the animal, such as fever that prevents it from grazing and causes lossof appetite; mange that obviously affects its flesh or its health; deep wounds that affect its health, and so on. iii – Obvious lameness, which prevents the animal from walking normally. iv – Emaciation that leaves no marrow in the bones, when the Prophet (peace and blessings of Allaah be upon him) was asked about what should be avoided in udhiyah, hegestured with his hand and said: “Four: alame animal which is obviously lame, a one-eyed animal whose defect is obvious, a sick animal whose sickness is obvious, and an emaciated animal that no one would choose.” Narrated by Maalik in al-Muwatta’ from the hadeeth of al-Bara’ ibn ‘Aazib. 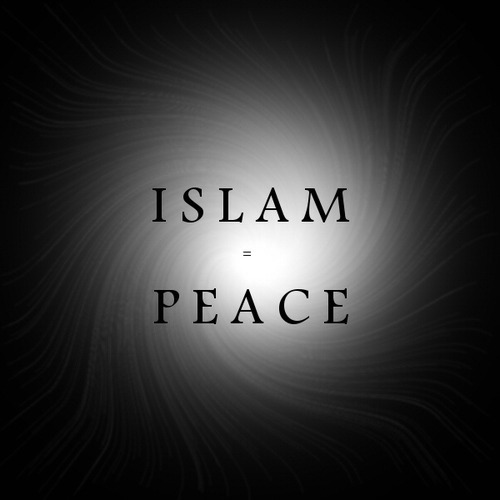 According to a hadeeth narrated from him inal-Sunan, he said: “The Messenger of Allaah(peace and blessings of Allaah be upon him) stood up among us and said: ‘There are fourwhich are not permissible for sacrifice,’” andhe mentioned something similar. Classed as saheeh by al-Albaani in Irwa’ al-Ghaleel, 1148.
a- One that is blind in both eyes. b- One that has eaten more than it can stand,until the danger has passed. c- One that has encountered difficulty in giving birth, until all danger has passed. d- One that has suffered something that could kill it, such as strangulation or a fall from a high place, until the danger has passed. e- One that is unable to walk because of a defect. f- One that has had one of its forelegs or hind legs cut off. If these are added to the four defects mentioned in the text, the number of those that cannot be offered as sacrifices reaches ten – these six and the four mentioned above. The animal should belong to the person whois offering the sacrifice, or he should have permission for that either on the grounds of sharee’ah or from the owner. The sacrifice isnot valid if the animal slaughtered does not belong to the person who is sacrificing it, such as one that has been taken by force, stolen, or taken on the basis of a false claim, etc, because it is not permissible to draw closer to Allaah by means of sin. A sacrifice offered by the guardian of an orphan from the orphan’s property is valid if that is customary and if hefeels sad about not offering a sacrifice. A sacrifice offered by a guardian from the property of the person under his care is valid, if done with permission. No one else should have any rights to the sacrificial animal; the sacrifice of an animal that is held in pledge is not valid. It should be slaughtered at the time specifiedin sharee’ah, which is from after the Eid prayer on the Day of Sacrifice until sunset on the last of the days of al-Tashreeq, which is the 13th of Dhu’l-Hijjah. So the days when the sacrificed may be offered are four:the day of Eid after the prayer, and the three days after that. Whoever slaughters it before the Eid prayer is over, or after sun sets on the 13th of Dhu’l-Hijjah, his sacrifice is not valid, because of the hadeeth narrated by al-Bukhaari from al-Bara’ ibn ‘Aazib (may Allaah be pleased with him), according to which the Prophet (peace and blessings of Allaah be upon him) said: “Whoever slaughters (his sacrifice) before the prayer, itis meat that he has brought to his family, butthat is not the sacrifice.” And he narrated that Jundub ibn Sufyaan al-Bajali (may Allaah be pleased with him) said: “I heard the Messenger of Allaah (peace and blessings of Allaah be upon him) saying, ‘Whoever slaughters the sacrifice before he prays, let him replace it with another.’” And it was narrated that Nubayshah al-Hadhali (may Allaah be pleased with him) said: “The Messenger of Allaah (peace and blessings of Allaah be upon him) said: ‘The days of al-Tashreeq are the days of eating, drinking and remembering Allaah.’” Narrated by Muslim. But if he has an excuse for delaying it beyond the days of Tashreeq, such as if the animal ran away, without there being any negligence on his part, and he could not findit until after the time was over, or he appointed someone else to slaughter it and that person forgot until the time was over, then there is nothing wrong with slaughtering it after the appointed time. Thisis by analogy with the one who sleeps and misses a prayer, or forgets it – he shouldpray it as soon as he wakes up or rememberit. It is permissible to slaughter the udhiyah at any time, night or day, but it is better to slaughter it during the day, and it is better toslaughter on the day of Eid after the two khutbahs. Each day is better than the day that follows it, because that means that one is hastening to do good. Minimum Age of Animal for Sacrifice. ..
Prophet (peace and blessings of Allaah be upon him) said: “Do not sacrifice anything but an adult animal, unless it is difficult for you, in which case you may slaughter a six-month old lamb (jadh’ah). 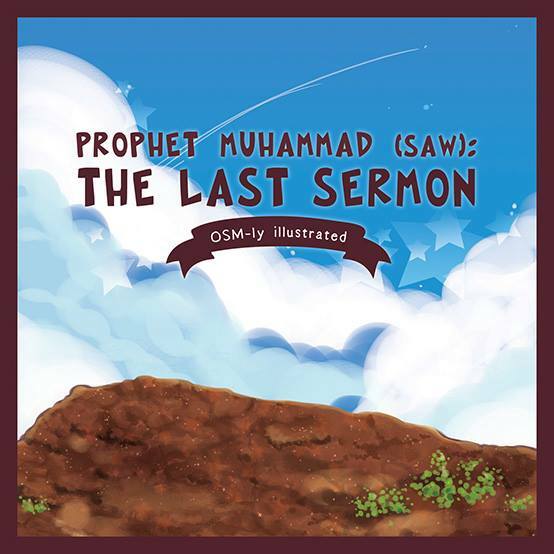 ” Narrated by Muslim. In the case of camels it means one that is five years old. The jadh’ah is that which is half a year old. So it is not correct to sacrifice a camel, cow or goat that has not yet reached maturity, or a sheep that is less than six months old. There are tons of reasons why you wouldn’t want to pass up this opportunity. Do you know which one? The first ten days of Dhu’l-Ḥijjah. It’s that time of the year again, the last month of the lunar calendar for the year 1431 after the Hijrah of the Prophet Muḥammad, ṣallallāhu ‘alayhi wa sallam. 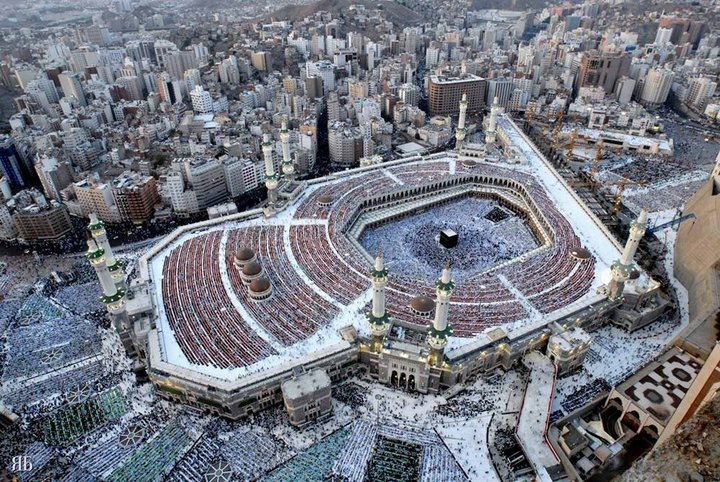 This is the time when more than two million people from all around the globe will be meeting together for at least five days in the plains of Makkah, Mina, ‘Arafah and Muzdalifah to perform their sacred journey to Makkah, known to us as al-Hajj, the pilgrimage. What bonds them together? One thing: al-Islam. If you are already reading this, most likely you are not going to Hajj. And if you’re there already, then what on earth are you doing wasting your time online? Go to the Haram and enjoy your ṭawāf. There are two chances in life: the one which you have already missed and the one which you don’t want to miss. What you already have is no longer a chance, its reality. Therefore, for those of us who were unable to be there in Makkah, why should we value these special days of the year? Here are my top five reasons. Ibn Kathīr rahimahullah, in his tafsir, referred to these ten days as the ten days of Dhu’l-Ḥijjah. He also attributed this opinion to Ibn ʿAbbās, Ibn Az-Zubayr and others of the righteous predecessors. The good deeds performed during these ten days are most rewarded, more than any other time of the year. (مَا مِنْ أيَّامٍ العَمَلُ الصَّالِحُ فِيهِنَّ أحَبُّ إلى الله مِنْ هَذهِ الأيَّامِ العَشْرِ) ، فقالُوا يا رسولُ الله: ولا الجِهَادُ في سَبِيلِ الله؟ فقالَ رسولُ الله : ( ولا الجِهَادُ في سَبِيلِ الله، إلاّ رَجُلٌ خَرجَ بِنَفْسِهِ ومَالِهِ، فَلَمْ يَرْجِعْ من ذَلِكَ بِشَيْءٍ). It is a day when many people will be emancipated from the fire of Hell. Hajj and multiple Umrahs by millions of people. 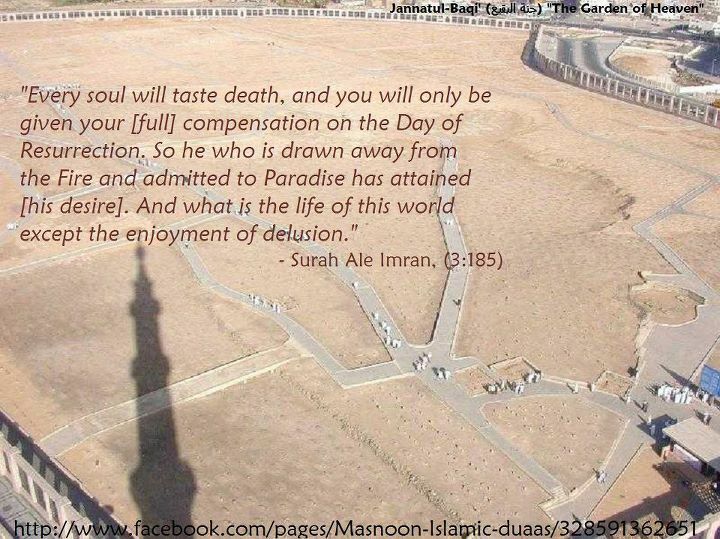 The sacrifice of the dunya and this world for the sake of attending the Hajj. The display of humility, humbleness and devotion in the actual rituals of Hajj. Tawaaf around the Ka’bah and Sai’ between the two hills of Safa and Marwa. 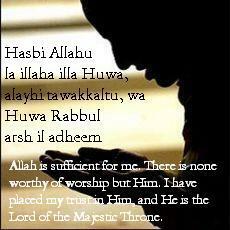 Abundance of Dhikr, the praise of Allah especially takbeer and tahleel and what other pilgrims say the most, Talbiyah. Offering the hadi’y and udhiyah or qur’ban the sacrifice of livestock and feeding the poor. The engagement in long du’a or supplications as a sign of humility and humbleness. Maintaining the prayers in the sacred sites al-Haram in Makkah and the Masjid of the Prophet in Madinah. The recitation of the Qur’an. “The best day with Allah is yum-an-Nahr, the day of sacrifice and then yum-al-qarr (the day that follows, when the pilgrims reside in the camps of Mina for worship).” (Ahmad, Abu Dawood and an-Nasa’iee). So, now that you know the significance of this season, what do you need to do? Increase your level of worship during the day and during the night. Try to achieve one khatma of the Qur’an (reading it from cover to cover). 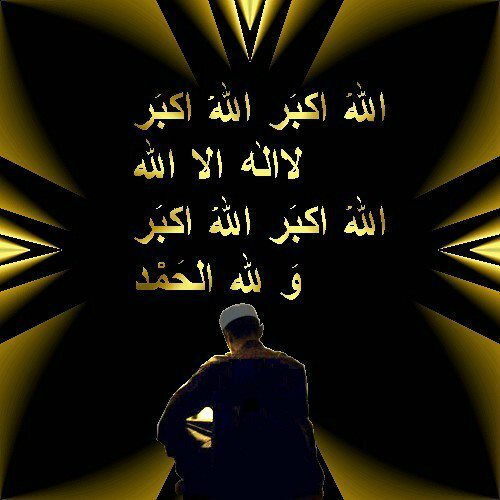 Keep your tongue moist with dhikr and praise of Allah wherever you are. Maintain a state of ṭahārah and wuḍū’ at all times. Make most of your dhikr Takbīr (like the one you recite on ‘Id day). 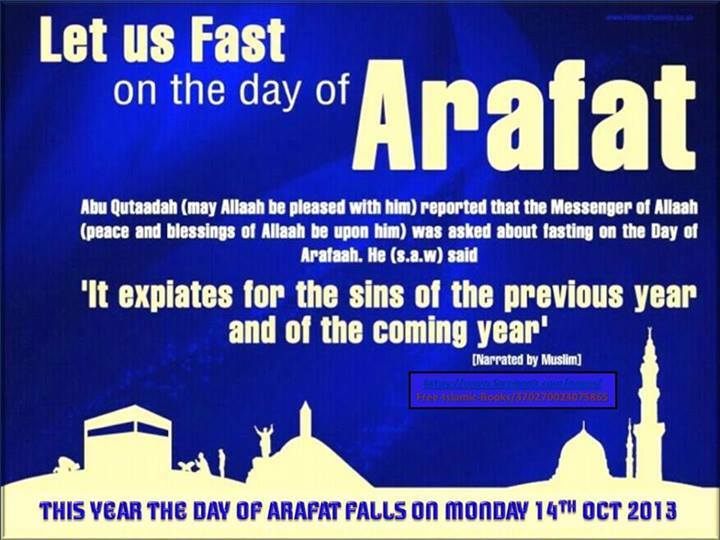 Fast a few days while the days are short and cold, particularly the 9th, the day of ‘Arafah. If you haven’t paid for the qurban (sacrificial animal) yet, make sure to do so. Perhaps you should donate one to those who are most in need of it in areas such as Pakistan and Gaza. Wake up before Fajr time and pray Qiyam-ul-Layl. Pray your Fardh salat on time. Make sure you don’t miss any of the Nafl and Sunnah prayers. Give charity and help those who are less fortunate prepare for the Eid day. Share the spirit of the season and be cheerful with all people. There is so much you can do for the ten days of Dhu’l-Ḥijjah, but you are the one who knows your schedule better than any one else. Make sure to make this season a priority and may Allah grant you all Jannatul Firdous. Remember, there are two chances in life: the one you already missed, and the one you don’t want to miss. 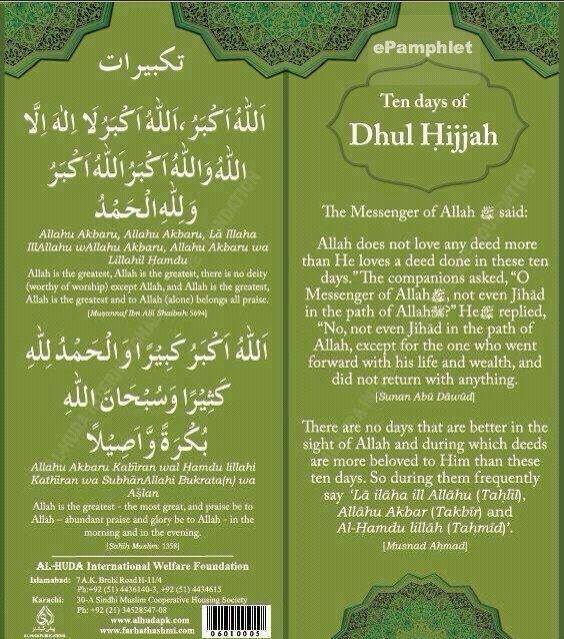 So don’t miss out on the ten days of Dhu’l-Ḥijjah. 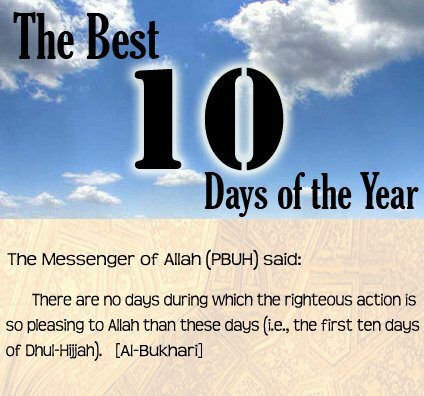 Tags: 10 DAYS OF VIRTUE & RIGHTEOUSNESS (Dhull-Hijjah), A Beutiful Hadith, and the Holy Spirit, Jesus, The Conditions for Udhiyah (Sacrifice), VIRTUES OF THE FIRST TEN DAYS OF DHUL HIJJAH, Who is Allah, Who Is poor ? Praise be to Allaah Who has created Time and has made some times better than others, some months and days and nights better than others, when rewards are multiplied many times, as a mercy towards His slaves. This encourages them to do more righteous deeds and makes them more eager to worship Him, so that the Muslim renews his efforts to gain a greater share of reward, prepare himself for death and supply himself in readiness for the Day of Judgement. This season of worship brings many benefits, such as the opportunity to correct one’s faults and make up for any shortcomings or anything that one might have missed. 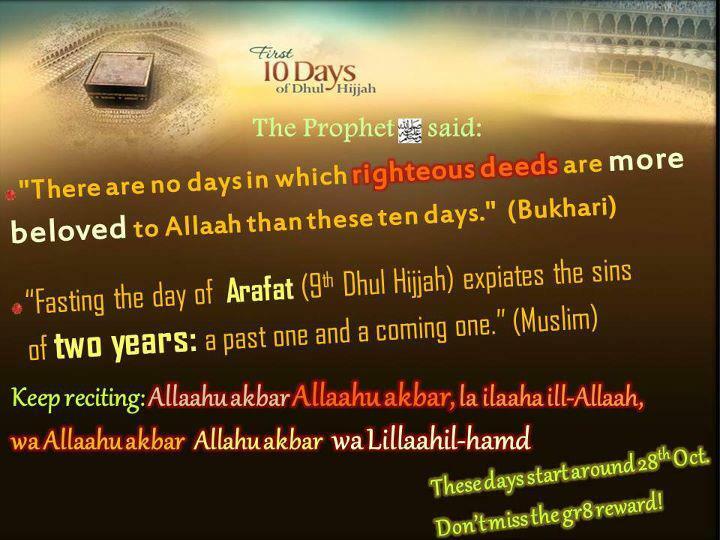 -These ten days include Yawm ‘Arafaah (the Day of ‘Arafaah), on which Allaah perfected His Religion. Fasting on this day will expiate for the sins of two years. 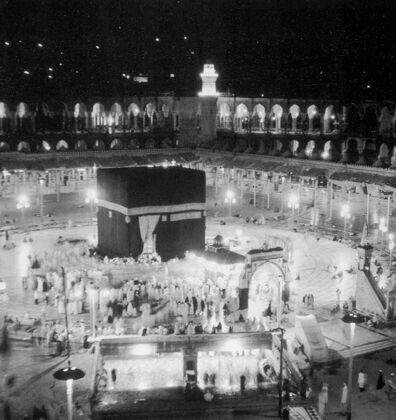 These days also include Yawm al-Nahar (the Day of Sacrifice), the greatest day of the entire year and the greatest day of Hajj, which combines acts of worship in a way unlike any other day. 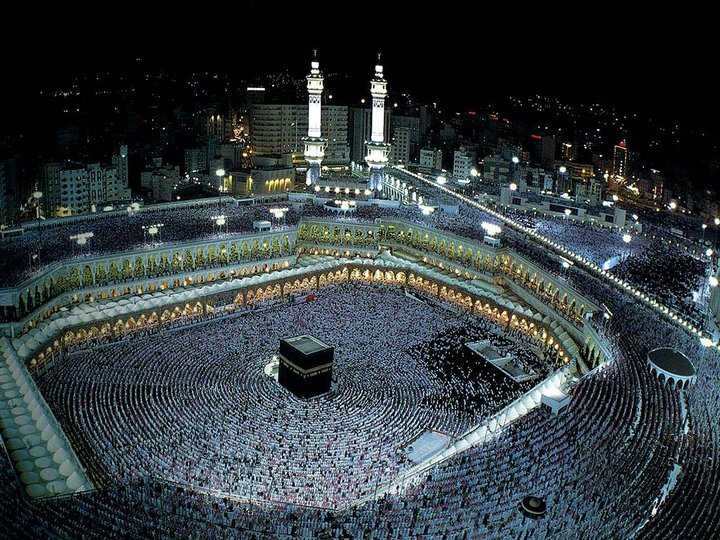 -These ten days include the days of sacrifice and of Hajj. Concerning the types of worship to be performed during these ten days: one must understand that these days are a great blessing from Allaah to His slave, which is appreciated properly by the actively righteous. It is the Muslim’s duty to appreciate this blessing and make the most of the opportunity, by devoting these ten days to paying more attention to striving hard in worship. Among His blessings to His slaves, Allaah has given us many ways in which to do good and worship Him, so that the Muslim may be constantly active and consistent in his worship of his Lord. (Reported by al-Nisaa’i, 4/205 and by Abu Dawud; classified by al-Albaani as saheeh in Saheeh Abi Dawud, 2/462). It is Sunnah to say Takbeer (“Allaahu akbar”), Tahmeed (“Al-hamdu Lillaah”), Tahleel (“La ilaha ill-Allaah”) and Tasbeeh (“Subhaan Allaah”) during the first ten days of Dhu’l-Hijjah, and to say it loudly in the mosque, the home, the street and every place where it is permitted to remember Allaah and mention His name out loud, as an act of worship and as a proclamation of the greatness of Allaah, may He be exalted. Men should recite these phrases out loud, and women should recite them quietly. Takbeer at this time is an aspect of the Sunnah that has been forgotten, especially during the early part of this period, so much so that one hardly ever hears Takbeer, except from a few people. This Takbeer should be pronounced loudly, in order to revive the Sunnah and as a reminder to the negligent. There is sound evidence that Ibn ‘Umar and Abu Hurayrah (may Allaah be pleased with them) used to go out in the marketplace during the first ten days of Dhu’l-Hijjah, reciting Takbeer, and the people would recite Takbeer when they heard them. (Reported by al-Tirmidhi, 7/443; this is a hasan hadeeth because of corroborating asaaneed). Doing more good deeds in general, because good deeds are beloved by Allaah and will bring a great reward from Him. 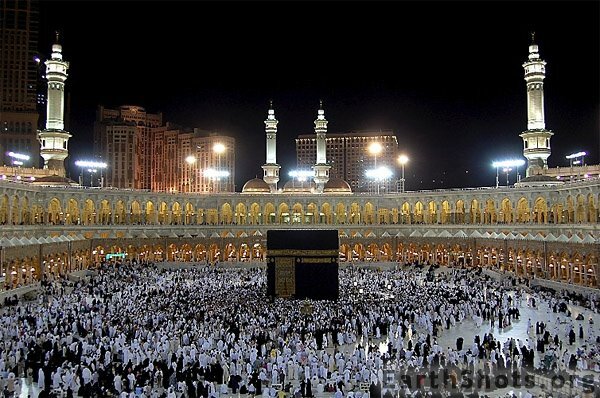 Whoever is not able to go to Hajj should occupy himself at this blessed time by worshipping Allaah, praying (salaat), reading Qur’an, remembering Allaah, making supplication (du’aa’), giving charity, honouring his parents, upholding the ties of kinship, enjoining what is good and forbidding what is evil, and other good deeds and acts of worship. during these ten days is offering a sacrifice, by choosing a high-quality animal and fattening it, spending money for the sake of Allaah. One of the most important things to do during these ten days is to repent sincerely to Allaah and to give up all kinds of disobedience and sin. Repentance means coming back to Allaah and foregoing all the deeds, open and secret, that He dislikes, out of regret for what has passed, giving it up immediately and being determined never to return to it, but to adhere firmly to the Truth by doing what Allaah loves. If a Muslim commits a sin, he must hasten to repent at once, without delay, firstly because he does not know when he will die, and secondly because one evil deed leads to another. Repentance at special times is very important because in most cases people’s thoughts turn towards worship at these times, and they are keen to do good, which leads to them recognizing their sins and feeling regret for the past. Pray your Fard salat on time. There is much to be gained, so make the most of the opportunity afforded by these invaluable and irreplaceable ten days. Hasten to do good works, before death strikes, before one can regret one’s negligence and failure to act, before one is asked to return to a place where no prayers will be answered, before death intervenes between the hopeful one and the things he hopes for, before you are trapped with your deeds in the grave. O you whose hard heart is as dark as the night, is it not time that your heart was filled with light and became soft? Expose yourself to the gentle breeze of your Lord’s mercy during these ten days, for Allaah will cause this breeze to touch whomever He wills, and whoever is touched by it will be happy on the Day of Judgement. May Allaah bless our Prophet Muhammad and all his Family and Companions. Please don’t forget us in your prays, and Sallam alaikum warahmatullahe wa barakatuh. 6:19 AM, Wednesday Nov.02 2011, Kabul-AFG. Verily, the praise belongs to Allah, the Most High, and May the Blessings of Allah and Peace be upon His Prophet Muhammad and his family and companions, all of them. “There aren’t any days greater, nor any days in which deeds done in them are more beloved to Allah, the Most High, than these ten days (of Zul-Hijjah). First: The performance of Haj and Umrah, and these are the best of deeds that may be done. 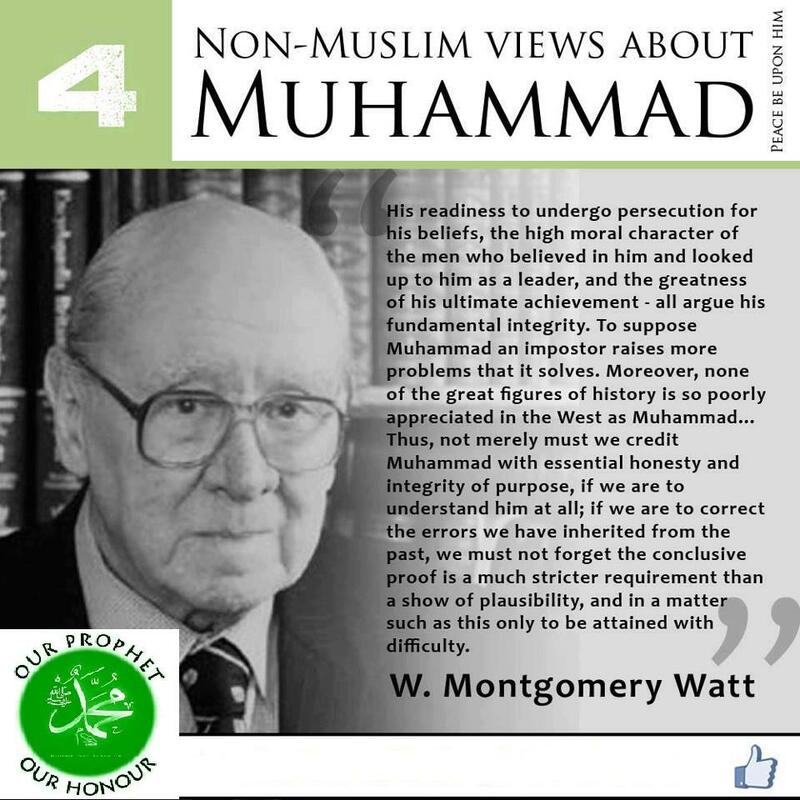 And what indicates their superiority are a number of Ahaadith, one of which is the saying of the Prophet (PBUH). and the reward of the Haj which is accepted by Allah, the Most High, is nothing but Paradise. It is reported about Ibn Umar and Abu Hurairah that: the two of them used to go out to the market place during the ten days (of Zul-Hijjah) saying: Allahu Akbar, causing the people also to say it. Sahabah and those who followed their ways. Verily, the Sunnah is for everyone to say the Takbeer individually. And this is (generally) applicable to Dhikr and supplications, except if the person doesn’t know what to say. In that case he may repeat after someone else until he learns (the words to be said). It is also permissible to make Dhikr with all the different wording of Takbeer and Tahmeed and Tasbeeh, and the rest of the Islamic legislated supplications (from the Qur’an and Sunnah). Fifth: Doing plenty of voluntary (nafl) righteous deeds of worship like Prayer, Charity, Jihaad, reading the Qur’an, Commanding what is Good and Forbidding what is Evil, and other such deeds. Verily, these are amongst the deeds that are multiplied in these days. It is during these days that even deeds that are less preferred, are superior and more beloved to Allah than superior deeds done at other times. (These deeds are superior) even to al-Jihaad – which is one of the most superior of all deeds – except in the case of one whose horse is killed and his blood is spilled (loss of life in Jihaad). 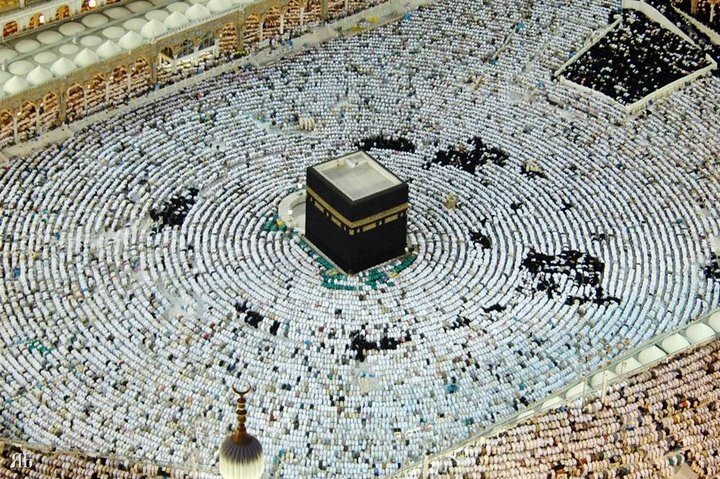 the Day of Sacrifice (10th of Zul-Hijjah) for those performing Haj (pilgrims); and it continues until Asr prayer on the last day of the days of Tash-reeq (13th of Zul-Hijjah). Eighth: Offering animal as Udhyia It has been narrated from Umm Salamah (may Allah be pleased with her) that the Prophet Mohammad (PBUH) said: If you see the Hilal (new moon) of Zul-Hijjah, and any one of you wants to make a sacrifice, then he should not cut (anything) from his hair and his nails. (Muslim and others). And in one narration, he said: .Then he should not cut (anything) from his hair, nor from his nails, until he performs the sacrifice. The apparent meaning of this prohibition is that it is particularly for the one whom the sacrifice is for, and does not include the wife or children, unless there is an individual sacrifice for one of them. There is no harm in washing the head, or scratching it, even if hairs may fall out. Ninth: It is incumbent for the Muslim (who is not performing Haj) to make every effort to perform the Eid Prayer wherever it is performed, and to be present for the Khutbah and benefit. pride and vanity. He should not make it a season for disobedience and increase in the forbidden things like music and singing, uncontrolled amusement, intoxicants and the like – those things which could cause the cancellation of the good deeds done in these days (of Zul-Hijjah). Tenth: After what has been mentioned, it is fitting that every Muslim, male and female, take advantage of these days by obeying Allah, the Most High, remembering Him, thanking Him, fulfilling all the obligatory duties, and staying far away from the prohibited things. He must take full advantage of this season, and the open display of Allah’s gifts, to attain the pleasure of his Lord. 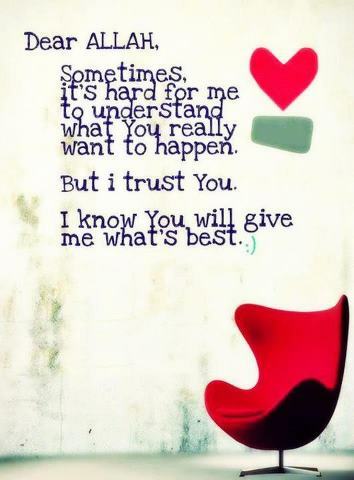 Surely, Allah, the Most High, is the One Who grants success, and He is the Guide to the Straight Path. And may the blessings of Allah, the Most High, and peace be upon Muhammad and his family and companions! Ghaira: A sense of honour and prestige, and the anger caused by its being violated. 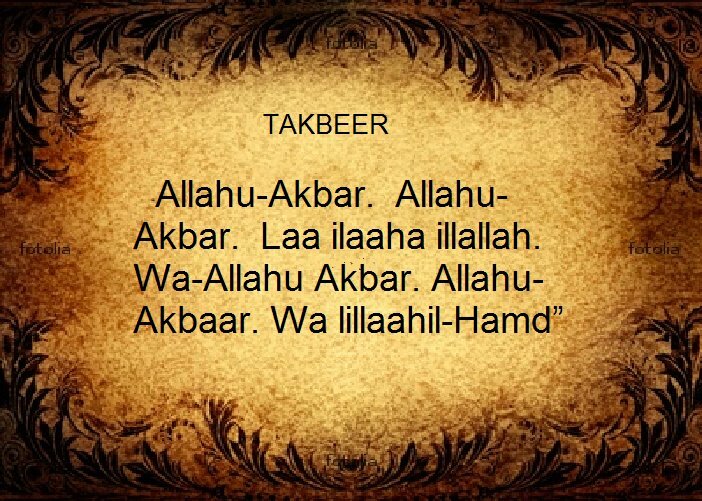 At-Takbeer al-Mutlaq: the Takbeer (Allahu Akbar) which is unrestricted to specific times or any specific form. These four faults render an animal unsuitable for sacrifice, and they include similar faults or more severe faults. c– One that has encountered difficulty in giving birth, until all danger has passed.